Radio, once known as "wireless telegraphy" or "radiotelegraphy," is the wireless communication of signals by transmitting electromagnetic waves at "radio frequencies"—that is, at frequencies lying below the visible and infrared regions of the electromagnetic spectrum. The term "radio" is also used for the equipment used to receive these transmissions, and the radio-frequency waves are known as "radio waves." Radio technology gives humanity the convenience of extremely rapid communications, because radio waves travel at the speed of light. In addition, it eliminates the need for extensive wiring between points of communication. This technology has been used for many practical applications, including (but not limited to) the following: Radio and television broadcasting, ship and aircraft navigation systems, cellular phones, walkie-talkies, baby monitors, garage door openers, wireless clocks, remote-controlled devices, the global positioning system (GPS), and spacecraft communications systems. Thus people are surrounded by invisible radio waves at many different frequencies, which can be picked up by appropriate receivers. Radio waves occupy a wide region of the electromagnetic spectrum, with frequencies ranging from a few tens of hertz (Hz) to a few hundred gigahertz (GHz). These frequencies, which are lower than those for visible light and infrared radiation, are broken up in smaller blocks for easier classification. Only small portions of this range of radio waves are tapped for commercial uses. Radio waves are classified as "non-ionizing radiation" because the energy of each individual photon of radio frequency is too low to remove an electron from an atom. 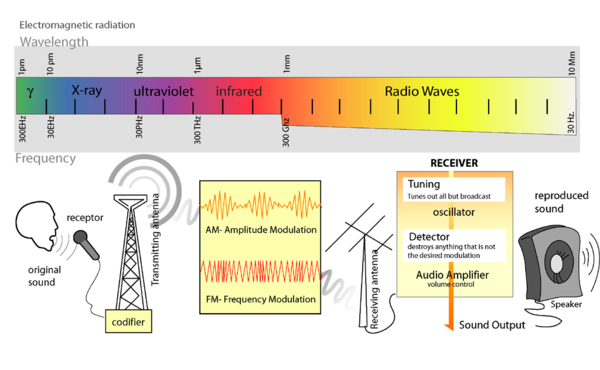 Electromagnetic spectrum (top) and diagram of radio transmission of an audio signal (bottom). For radio communications technology, appropriate equipment is needed at the transmitting and receiving ends. At the transmitting end, sounds, images, and other forms of information are converted into electrical signals, with the aid of equipment such as a microphone or video camera. These signals are used to "modulate" (modify) a carrier wave that is produced in a transmitter. The electrical signals are converted to electromagnetic waves within a transmission antenna and beamed out into space. At the receiving end, some of these waves are picked up by an antenna attached to a receiver, which may be a radio or television set, for example. If the receiver is tuned to a particular radio-wave frequency, it will decode the signals associated with that frequency and convert them back into sounds or images through a speaker or display monitor, as the case may be. Modulation of the carrier wave generally takes one of two forms: Either the amplitude or the frequency of the carrier wave is modulated, and the resultant form is known as "amplitude modulation" (AM) or "frequency modulation" (FM), respectively. The advantage of frequency modulation is that noise is minimized. In either case, the radio waves travel at the speed of light, not only moving along the line of sight but also being deflected by the ionosphere. In addition, radio communications are often relayed by ground-based stations and satellites positioned in orbit around the Earth. Radio technology was originally called "wireless telegraphy," which was later shortened to "wireless." The prefix "radio-," in the sense of wireless transmission, was first recorded in the word "radioconductor," coined by the French physicist Edouard Branly in 1897 and based on the verb "to radiate." The word "radio" (as a noun) is said to have been coined by advertising expert Waldo Warren (White, 1944) and appears in a 1907 article by Lee de Forest. The term was adopted by the U.S. Navy in 1912 and became common by the time of the first commercial broadcasts in the United States in the 1920s. (The noun "broadcasting" itself came from an agricultural term, meaning "scattering seeds.") The American term was then adopted by other languages in Europe and Asia, although Britain retained the term "wireless" until the mid-twentieth century. Timeline of early developments of radio communications. No one person can be credited with creating the radio. However, several individuals can be given credit for their contributions to the development of radio communications. Among them, three individuals are recognized for their claims to the invention of radio: Alexander Stepanovich Popov, Nikola Tesla, and Guglielmo Marconi. In early 1880s Joseph Henry and Michael Faraday, working separately, found that the current in one wire could induce or create a current in another wire, even though the two wires were not connected. This concept is known as the Induction Theory. In 1864 James Clerk Maxwell, explained the Induction Theory by developing the idea of electromagnetic waves that travel at the speed of light. In the 1880s, Heinrich Hertz proved Maxwell's electromagnetic theory. In 1894, Alexander Stepanovich Popov built his first radio receiver, which contained a coherer, a radio detector with a high-frequency current passing through thin wires to improve conductance. Further refining it as a lightning detector, he presented it to the Russian Physical and Chemical Society on May 7, 1895. In 1985 Guglielmo Marconi, an early radio experimenter and founder of the the first commercial organization devoted to development and use of radio, sent the first radio signals by using electromagnetic waves to send telegraph codes to a location about 1 mile away. In 1893 Nikola Tesla developed means to reliably produce radio frequencies, publicly demonstrated the principles of radio, and transmitted long-distance signals. He holds the U.S. patent for the invention of radio communication, defined as the "wireless transmission of data." In the early 1900s, electrical engineers developed vacuum tubes to detect and amplify radio signals. In 1901, Marconi sent radio signals across the Atlantic Ocean for the first time. In 1906 Reginald Fessenden and Lee de Forest invented amplitude-modulated (AM) radio, so that more than one station can send signals (as distinct from spark-gap radio, where one transmitter covers the entire bandwidth of the spectrum). In 1933 Edwin Armstrong invented frequency-modulated (FM) radio, so that an audio signal can avoid "static"–that is, interference from electrical equipment and atmospherics. In 1934, the FCC or the Federal Communications Commission, formerly the Federal Radio Commission was formed. The FCC licenses all non-military communication in the United States and assigns frequencies and call letters to broadcast stations, amateur operators, mariners, and aviators. The FCC license is renewed ever 7 years. Early radios ran the entire power of the transmitter through a carbon microphone. Some early radios used some type of amplification with battery power or an electric current, but until the mid-1920s, the most common type of receiver was the crystal set that required headphones. In the 1920s, amplifying vacuum tube radio receivers and transmitters came into use. In 1893, in St. Louis, Missouri, Tesla made devices for his experiments with electricity. Addressing the Franklin Institute in Philadelphia and the National Electric Light Association, he described and demonstrated in detail the principles of his work. The descriptions contained all the elements that were later incorporated into radio systems before the development of the vacuum tube. He initially experimented with magnetic receivers, unlike the coherers (a radio detector with a high-frequency current passing through thin wires to improve conductance, invented by Temistocle Calzecchi-Onesti at Fermo in Italy in 1884) used by Guglielmo Marconi and other early experimenters. Tesla is usually considered the first to apply the mechanism of electrical conduction to wireless practices. In 1896, Marconi was awarded the British patent 12039, "Improvements in transmitting electrical impulses and signals and in apparatus there-for," for radio. In 1897, he established the world's first radio station on the Isle of Wight, England. Marconi opened the world's first "wireless" factory in Hall Street, Chelmsford, England in 1898, employing around 50 people. Around 1900, Tesla opened the Wardenclyffe Tower facility and advertised services. By 1903, the tower structure neared completion. Various theories exist on how Tesla intended to achieve the goals of this wireless system (reportedly, a 200 kW system). Tesla claimed that Wardenclyffe, as part of a world system of transmitters, would have allowed secure multichannel transceiving of information, universal navigation, time synchronization, and a global location system. The next great invention was the vacuum tube detector, invented by a team of Westinghouse engineers. On Christmas Eve, 1906, Reginald Fessenden used a synchronous rotary-spark transmitter for the first radio program broadcast, from Brant Rock, Massachusetts. Ships at sea heard a broadcast that included Fessenden playing "O Holy Night" on the violin and reading a passage from the Bible. The first radio news program was broadcast August 31, 1920, by station 8MK in Detroit, Michigan. The first regular entertainment broadcasts commenced in 1922, from the Marconi Research Centre at Writtle, near Chelmsford, England. One of the first developments in the early twentieth century (1900-1959) was that of aircraft using commercial AM radio stations for navigation. This continued until the early 1960s, when VOR systems finally became widespread (though AM stations are still marked on U.S. aviation charts). In the early 1930s, single sideband and frequency modulation were invented by amateur radio operators. By the end of the decade, they were established commercial modes. 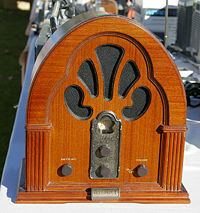 Radio was used to transmit pictures visible as television as early as the 1920s. Standard analog transmissions started in North America and Europe in the 1940s. In 1954, Regency introduced a pocket transistor radio, the TR-1, powered by a "standard 22.5 V Battery." In 1960, Sony introduced their first transistorized radio, small enough to fit in a vest pocket, and able to be powered by a small battery. It was durable, because there were no vacuum tubes to burn out. Over the next 20 years, transistors replaced tubes almost completely except for very high-power uses. In 1963, color television was commercially transmitted, and the first (radio) communication satellite, TELSTAR, was launched. In the late 1960s, the U.S. long-distance telephone network began to convert to a digital network, employing digital radios for many of its links. In the 1970s, LORAN became the premier radio navigation system. Soon, the U.S. Navy experimented with satellite navigation, culminating in the invention and launch of the GPS constellation in 1987. In the early 1990s, amateur radio experimenters began to use personal computers with audio cards to process radio signals. In 1994, the U.S. Army and the Defense Advanced Research Projects Agency, DARPA launched an aggressive, successful project to construct a software radio that could become a different radio on the fly by changing software. Software defined radios do not need all the components of a traditional radio since most of the modulation and traditional hardware systems are now being changed into software. The radio's function changes with the software, but the hardware remains the same. In this way, the same device can be used to receive broadcast radio systems, be used as a cell phone, or even a garage door opener simply by changing the software. The GNU Radio system is currently being developed through international efforts to create software radio that relies solely as free software. Digital transmissions began to be applied to broadcasting in the late 1990s. More and more radio users are listening to radio broadcast via a home computer or even via cellular phones using the Wireless Application Protocol WAP. Digital radio is being advertised as the new wave of radio broadcast that eliminates static or interference. More digital stations can be added without deleting older analog stations. Unfortunately, with competition from satellite radios and MP3 players, radio listeners are not willing to purchase new radio sets that will enable them to listen to the clearer quality of digital radio. Satellite radio is a fee based system that offers clear radio transmissions, commercial free, from around the world. Radio signals are not lost by moving away from the source station because unlike traditional broadcasts that come from radio stations, satellite radio signals are beamed from space. Currently, there are three satellite radio stations, XM Satellite Radio,Sirius Satellite Radio, and WorldSpace. Top-of-the-line, modern Sangean model PR-D3L radio receiver, sold by Digitor in Australia. Many of radio's early uses were maritime, sending telegraphic messages using Morse code between ships and land. The earliest users included the Japanese Navy scouting the Russian fleet during the Battle of Tsushima in 1905. One of the most memorable uses of marine telegraphy was during the sinking of the RMS Titanic in 1912, which included communications between operators on the sinking ship and nearby vessels, and communications to shore stations listing the survivors. Radio was used to relay orders and communications between armies and navies on both sides in World War I and is still being used today by the United States Military; Germany used radio communications for diplomatic messages once its submarine cables were cut by the British. The United States passed on President Woodrow Wilson's Fourteen Points to Germany via radio during the war. General broadcasting began in the 1920s, with the widespread introduction of radio receivers, particularly in Europe and the United States. Besides broadcasting, point-to-point broadcasting, including telephone messages and relays of radio programs, became widespread in the 1920s and 1930s. The "Golden Age of Broadcasting" began in the 1920s and ended with the introduction of television in the 1950s. Another use of radio in the pre-war years was the development of detecting and locating aircraft and ships by the use of radar (RAdio Detection And Ranging). Today, radio takes many forms, including wireless networks, mobile communications of all types, as well as radio broadcasting. 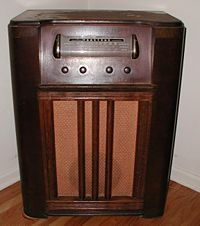 Before the advent of television, commercial radio broadcasts included not only news and music, but dramas, comedies, variety shows, and many other forms of entertainment. The War of the Worlds was broadcast on October 30, 1938, and caused widespread panic because people actually thought that the fictional "on-the-spot reporting" account of an alien invasion written by Orson Welles was real. Radio is unique among dramatic presentation in that it uses only sound. For more, see radio programming. AM broadcast radio sends music and voice in the Medium Frequency (MF—0.300 MHz to 3 MHz) radio spectrum. AM radio uses amplitude modulation, in which louder sounds at the microphone cause wider fluctuations in the transmitter power while the transmitter frequency remains unchanged. Transmissions are affected by static because lightning and other sources of radio add their radio waves to the ones from the transmitter. FM broadcast radio sends music and voice, with higher fidelity than AM radio. In frequency modulation, louder sounds at the microphone cause the transmitter frequency to fluctuate farther, the transmitter power stays constant. FM is transmitted in the Very High Frequency (VHF—30 MHz to 300 MHz) radio spectrum. It requires more radio frequency space than AM and there are more frequencies available at higher frequencies, so there can be more stations, each sending more information. VHF radio waves travel in straight lines so the reception range is generally limited to about 50-100 miles. During unusual upper atmospheric conditions, FM signals are occasionally reflected back towards the Earth by the ionosphere, resulting in Long distance FM reception. FM receivers are subject to the capture effect, which causes the radio to only receive the strongest signal when multiple signals appear on the same frequency. FM receivers are relatively immune to lightning and spark interference. FM Subcarrier services are secondary signals transmitted "piggyback" along with the main program. Special receivers are required to utilize these services. Analog channels may contain alternative programming, such as reading services for the blind, background music or stereo sound signals. In some extremely crowded metropolitan areas, the subchannel program might be an alternate foreign language radio program for various ethnic groups. Subcarriers can also transmit digital data, such as station identification, the current song's name, web addresses, or stock quotes. In some countries, FM radios automatically retune themselves to the same channel in a different district by using sub-bands. Some sub-bands can only be heard via High Definition digital receivers. Aviation voice radios use VHF AM. AM is used so that multiple stations on the same channel can be received. (Use of FM would result in stronger stations blocking out reception of weaker stations due to FM's capture effect). Aircraft fly high enough that their transmitters can be received hundreds of miles (kilometers) away, even though they are using VHF. Marine voice radios can use AM in the shortwave High Frequency (HF—3 MHz to 30 MHz) radio spectrum for very long ranges or narrowband FM in the VHF spectrum for much shorter ranges. Government, police, fire, and commercial voice services use narrowband FM on special frequencies. Fidelity is sacrificed to use a smaller range of radio frequencies, usually five kHz of deviation, rather than the 75 kHz used by FM broadcasts and 25 kHz used by TV sound. Civil and military HF (high frequency) voice services use shortwave radio to contact ships at sea, aircraft, and isolated settlements. Most use single sideband voice (SSB), which uses less bandwidth than AM. On an AM radio SSB sounds like ducks quacking. Viewed as a graph of frequency versus power, an AM signal shows power where the frequencies of the voice add and subtract with the main radio frequency. SSB cuts the bandwidth in half by suppressing the carrier and (usually) lower sideband. This also makes the transmitter about three times more powerful, because it doesn't need to transmit the unused carrier and sideband. TETRA, Terrestrial Trunked Radio is a digital cell phone system for military, police, and ambulances. Commercial services such as XM, WorldSpace and Sirius offer encrypted digital Satellite radio. Cell phones transmit to a local cell transmitter/receiver site, which connects to the public service telephone network through an optic fiber or microwave radio. When the phone leaves the cell radio's area, the central computer switches the phone to a new cell. Cell phones originally used FM, but now most use various digital encodings like CDMA. Satellite phones come in two types: INMARSAT and Iridium. Both types provide world-wide coverage. INMARSAT uses geosynchronous satellites, with aimed high-gain antennas on the vehicles. Iridium provides cell phones, with the cells being satellites in orbit. Television sends the picture as AM and the sound as FM, with the sound carrier a fixed frequency (4.5 MHz in the NTSC system) away from the video carrier. Analog television also uses a vestigial sideband on the video carrier to reduce the amount of space required for transmission. All satellite navigation systems use satellites with precision clocks. The satellite broadcasts its position, and the time of the transmission. The receiver's computer listens to four satellites and plots the position of the satellite based on the time-of-flight of the radio signals from the satellite. Radio direction-finding is the oldest form of radio navigation. Before 1960 navigators used movable loop antennas to locate commercial AM stations near cities. In some cases they used marine radiolocation beacons, which share a range of frequencies with amateur radio operators just above AM radio. Loran systems also used time-of-flight radio signals, but from radio stations on the ground. VOR systems (used by aircraft), have an antenna array that transmits two signals simultaneously. A directional signal rotates like a lighthouse at a fixed rate. When the directional signal is facing north, an omnidirectional signal pulses. By measuring the difference in phase of these two signals, an aircraft can determine its position from the station and establish a line of position. An aircraft can get readings from two VORs, and locate its position at the intersection of the two radials, known as a "fix." When the VOR station is set beside the DME (Distance Measuring Equipment), the aircraft can determine its bearing and range from the station to provide a fix from only one ground station. Such stations are called VOR/DMEs. The military operates a similar system of navigation systems, called TACANs, which are often built into VOR stations. Such stations are called VORTACs. Because TACANs include distance measuring equipment, VOR/DME and VORTAC stations are identical in navigation potential to civil aircraft. Search radars scan a wide area with pulses of short radio waves. They usually scan the area two to four times a minute. Sometimes search radars use the doppler effect to separate moving vehicles from clutter. Targeting radars use the same principle as search radar but scan a much smaller area far more often, usually several times a second or more. Weather radars resemble search radars, but use radio waves with circular polarization and a wavelength to reflect from water droplets. Some weather radars use the doppler effect to measure wind speeds. Emergency Position-Indicating Radio Beacons (EPIRBs), Emergency Locating Transmitters (ELTs), or Personal Locator Beacons (PLBs) are small radio transmitters that satellites can use to locate a person, pet, or vehicle needing rescue. Their purpose is to help rescue people in the first day, when survival is most likely. There are several types, with widely-varying performance. Most new radio systems are digital. The oldest form of digital broadcast was spark gap telegraphy, used by pioneers such as Marconi. By pressing the key, the operator could send messages in Morse code by energizing a rotating commutating spark gap. The rotating commutator produced a tone in the receiver, where a simple spark gap would produce a hiss, indistinguishable from static. Spark gap transmitters are now illegal, because their transmissions span several hundred megahertz. This is very wasteful of both radio frequencies and power and wold interfere with other radio transmissions. The next advance was continuous wave telegraphy, or CW (Continuous Wave), in which a pure radio frequency, produced by a vacuum tube electronic oscillator was switched on and off by a key. A receiver with a local oscillator would "heterodyne" with the pure radio frequency, creating a whistle-like audio tone. CW uses less than 100 Hz of bandwidth. CW is still used, these days primarily by amateur radio operators (hams). Strictly, on-off keying of a carrier would be known as "Interrupted Continuous Wave" or ICW. Radio teletypes usually operate on short-wave (HF) and are used in much of the U.S. military's legacy systems because they create written information without a skilled operator. They send a bit as one of two tones. Groups of five or seven bits become a character printed by a teletype. From about 1925 to 1975, radio teletype was how most commercial messages were sent to less developed countries. These are still used by the military and weather services. Aircraft use a 1200 Baud radioteletype service over VHF to send their ID, altitude, and position, and get gate and connecting-flight data. Microwave dishes on satellites, telephone exchanges, and TV stations usually use quadrature amplitude modulation (QAM). QAM sends data by changing both the phase and the amplitude of the radio signal. Engineers like QAM because it packs the most bits into a radio signal. Usually the bits are sent in "frames" that repeat for error checking. A special bit pattern is used to locate the beginning of a frame. Systems that need reliability, or that share their frequency with other services, may use "corrected orthogonal frequency-division multiplexing" or COFDM. COFDM breaks a digital signal into as many as several hundred slower subchannels. The digital signal is often sent as QAM on the subchannels. Modern COFDM systems use a small computer to make and decode the signal with digital signal processing, which is more flexible and far less expensive than older systems that implemented separate electronic channels. COFDM resists fading and ghosting because the narrow-channel QAM signals can be sent slowly. An adaptive system, or one that sends error-correction codes can also resist interference, because most interference can affect only a few of the QAM channels. COFDM is used for WiFi, some cell phones, Digital Radio Mondiale, Eureka 147, and many other local area network, digital TV, and radio standards. Radio-frequency energy generated for heating of objects is generally not intended to radiate outside of the generating equipment, to prevent interference with other radio signals. Microwave ovens use intense radio waves to heat food. (Note: It is a common misconception that the radio waves are tuned to the resonant frequency of water molecules. The microwave frequencies used are actually about a factor of ten below the resonant frequency.) Diathermy equipment is used in surgery for sealing of blood vessels. Induction furnaces are used for melting metal for casting. Tractor beams can use radio waves which exert small electrostatic and magnetic forces. These are enough to perform station-keeping in microgravity environments. Conceptually, spacecraft propulsion: Radiation pressure from intense radio waves has been proposed as a propulsion method for an interstellar probe called Starwisp. Since the waves are long, the probe could be a very light metal mesh, and thus achieve higher accelerations than if it were a solar sail. Amateur radio is a hobby in which enthusiasts purchase or build their own equipment and use radio for their own enjoyment. They may also provide an emergency and public-service radio service. This has been of great use, saving lives in many instances. Radio amateurs are able to use frequencies in a large number of narrow bands throughout the radio spectrum. They use all forms of encoding, including obsolete and experimental ones. Several forms of radio were pioneered by radio amateurs and later became commercially important, including FM, single-sideband AM, digital packet radio, and satellite repeaters. Personal radio services such as Citizens' Band Radio, Family Radio Service, Multi-Use Radio Service, and others exist in North America to provide simple, (usually) short range communication for individuals and small groups, without the overhead of licensing required by the Federal Communications Commission FCC. Similar services exist in other parts of the world. A number of schemes have been proposed Wireless energy transfer. Various plans included transmitting power using microwaves, and the technique has been demonstrated. (See Microwave power transmission). These schemes include, for example, solar power stations in orbit beaming energy down to terrestrial users. Radio remote controls use soft radio waves to transmit control data to a remote object as in some early forms of guided missile, some early TV remotes, and a range of model boats, cars, and airplanes. Baby monitors and garage door openers still use this form of transmission. Large industrial remote-controlled equipment such as cranes and switching locomotives now usually use digital radio techniques to ensure safety and reliability. Energy autarkic radio technology consists of a small radio transmitter powered by environmental energy (push of a button, temperature differences, light, vibrations, etc.). ↑ IEEE Virtual Museum, Nikola Tesla. Retrieved June 13, 2007. ↑ Tesla Society, Recording. Retrieved June 13, 2007. A História da Rádio em Datas (1819-1997). Retrieved June 13, 2007. Ramo, Simon, et.al. 1994. Fields and Waves in Communication Electronics. Hoboken, NJ: John Wiley & Sons, Inc.
Aitkin, Hugh G. J. The Continuous Wave: Technology and the American Radio, 1900-1932 (Princeton University Press, 1985). Briggs, Asa. The History of Broadcasting in the United Kingdom (Oxford University Press, 1961). Ewbank, Henry and Lawton, Sherman P. Broadcasting: Radio and Television (Harper & Brothers, 1952). Maclaurin, W. Rupert. Invention and Innovation in the Radio Industry (The Macmillan Company, 1949). Rao, Nannapaneni N. 2000. Elements of Engineering Electromagnetics. Upper Saddle River, NJ: Prentice-Hall, Inc.
Schwoch, James. The American Radio Industry and Its Latin American Activities, 1900-1939 (University of Illinois Press, 1990). Sterling, Christopher H. Electronic Media, A Guide to Trends in Broadcasting and Newer Technologies 1920-1983 (Praeger, 1984). White, Llewellyn. The American Radio (University of Chicago Press, 1947). De Lee Forest. Father of Radio: The Autobiography of Lee de Forest (1950). All links retrieved June 23, 2015. FMSCAN Type in a city name to get a complete FM/AM frequency list. FMLIST FM transmitter database for Europe, North America and some other regions. IAteacher: Interactive Explanation of Radio Receiver Construction. U.S. Supreme Court, "Marconi Wireless Telegraph co. of America v. United States." 320 U.S. 1. Nos. 369, 373. Argued April 9-12, 1943; decided June 21, 1943. Radio Locator: Find a radio station in your area. The Broadcast Archive—Radio History on the Web!. United States Early Radio History. This page was last modified on 23 June 2015, at 15:50.